Here’s an aerial view of the North 40 boardwalk under construction at the corner of Weston Road and Turner Road in Wellesley. High above the North 40 vernal pool and boardwalk. Photo via Michael Tobin. You can pay a visit to frogs, salamanders and more at the vernal pool by accessing the boardwalk from the north corner of the Weston Road Community Garden next to 148 Weston Rd. across from Howe St.
Bambino Technologies, Inc. is expanding into Wellesley to help connect families with local sitters. The launch is being led by Christine Schuldt, a local mom and marketing consultant who knows first-hand how difficult and time-consuming it can be to find trustworthy babysitters. Bambino is a mobile app that modernizes the way parents find, book, and pay trusted local sitters. Through integrated social connections, parents are connected to babysitters in their own neighborhood, who have already been reviewed and recommended by friends and neighbors. Booking, schedule reminders, and payment all happens right in the app. And sitters have the flexibility to earn money when it works into their own busy schedules. The first part of the local Bambino launch involves recruiting neighborhood sitters. Local sitters who are interested in flexible, part-time work can learn more about being a Bambino sitter. Note that sitters age 17 and younger require parental permission to join the app. Linear Retail, which already owns 48,000 square feet of Central Plaza properties on Wellesley Square’s Central Street (The GAP, etc., buildings), has now snapped up nearly 18,000 square feet of retail buildings on the opposite side of road. Linear, for a cool $17.6M, now owns 61-71 Central Street, which consists of two storefront retail buildings, including an adjoining 60-space parking lot. That property is fully occupied by 7 tenants, including CVS and Wasik’s. A new neighbor for Quebrada? 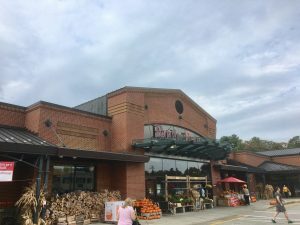 The latest scuttlebutt about the 276 Washington St., space in Wellesley Hills that has been home to Dayton Home and Whole Foods in the past is that a pet supplies business could be moving in. No confirmation on this yet from the property manager. The alewife are flipping and flopping around in Fuller Brook in Wellesley this month. Local kids have taken to helping some of those fish unable to scale the fish ladder near Grove Street. If the aquatic action has you in the mood for freshwater fishing, know that if you’ll need a license if you’re 15 or older. Pampered Puppies is just about ready to open at 159 Linden St. (in the space formerly occupied by Miss Michelle’s Center for the Performing Arts). The business will offer dog grooming and bathing, training and daycare. You can stop in to their Open House on Saturday, April 13, 8am – 6pm. Here’s a look at Wellesley’s most popular dog names and breeds for 2019, in case you’re wondering what kind of canine company your pooch will be keeping. Lucy has bounced Bella as the most popular dog name in Wellesley among 2,762 licensed pups in 2019, with labrador retrievers remaining the most common breed in town by far. Bella had been the most common dog name in Wellesley for 3 years running, but Lucy was never far behind. 40 Lucys have been licensed for 2019 vs. 30 Bellas. We suppose it’s possible that there are still a bunch of renegade Bellas out there just waiting for their owners to fill out the licensing application. Maggie, Buddy and Daisy have fallen off a bit. As for breeds, 407 labrador retrievers were licensed in Wellesley. Labs are followed by golden retrievers, golden doodles, labradoodles, and mixed breeds as the most popular dog breeds in town. Rhodesian ridgebacks, puggles, and Siberian huskies are among other breeds of which there are at least 10 in Wellesley. If you spaced on registering your dog by the April 1 deadline, you can still get in compliance by filling out the application online or sending it in by mail. Flo, a 2-year-old bernedoodle, was recently certified as therapy team with human friend Rani Elwy, by Dog B.O.N.E.S.